Ladders are so last year! Ladders are finished thanks to our innovative work stilts: You can put your old ladder in the cellar! By the way: Working on stilts is safe. Since launch, not a single accident in connection with work on our stilts has become known to us. Work stilts are attached to the legs. Therefore, the arms remain free and the craftsperson has full range of motion. Handiwork goes faster. ‘Do it yourself’are three words that are most associated with energy and time consumption. With practice, Installoo® work stilts can be used for many applications, such as for home improvement or hobby gardening. This saves time. It is easy to learn and saves money. So far we have not heard of any accidents involving craft stilts. The Installoo® GmbH was founded in 2007 by Christian Hinze. The company successfully distributes craft stilts with the motto “ladders were yesterday” which allow you to work even at higher altitudes. The business idea was developed by Christian Hinze, who as a skilled craftsman was confronted daily with these problems. Installoo® craft stilts are essential. With painters’ stilts, the workload that would result from the use of a ladder is eliminated. This saves time. 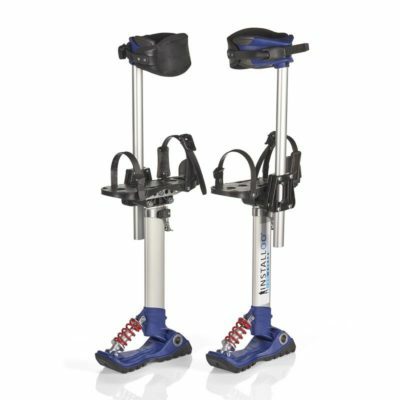 The Pro and Consumer-Line stilts are designed so that you do not constantly have to move from foot to foot, but may stand still in order to complete the task. This is easy to learn. Rather than set up the ladder, the stilts are simply strapped on and you can move freely, thus saving working time. Installoo® craft stilts are an alternative to ladders. The Consumer-Line is the beginner class for leisure and hobby. With the Consumer-Line painters’ stilts from Installoo® you can move flexibly. You can easily reach high workplaces. 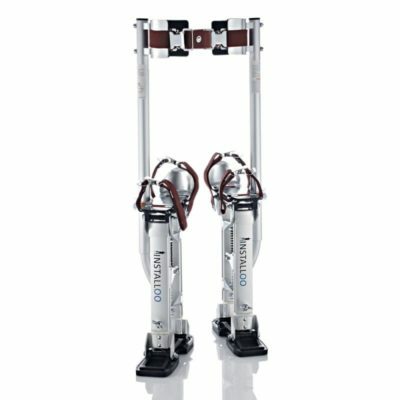 The Consumer-Line work stilts are made of high quality aluminium. They are available in three different sizes – M, L and XL. Your shoe size does not matter, as these painters’ stilts are suitable for all shoe sizes. Whichever size you need just depends on how high up you want to be. The Consumer-Line is suited to home improvers who want to wainscot the ceiling or get painting work done faster. Even hobby gardeners use these stilts while trimming the hedge. Consumer-Line stilts can also mean sports and fun. Some people use the stilts as sports equipment. Consumer-Line stilts have become indispensable for artists and street performers. The Pro-Line is ideal for use on construction sites. Installoo® craft stilts are just as flexible as if you were standing on the floor with your own two feet. The wide feet mean you are generally secure when carrying heavy things. The ergonomic suspension absorbs the weight automatically. The Installoo® Pro-Line stilts are also available in three different sizes: M, L and XL. One use saves time. Installoo® craft stilts can withstand up to 120 kg and are TÜV-approved. The work stilts are made of aluminium. Using the height adjustment the ideal working height can be easily found. Security protection for your feet is available. Operation is easy to learn. With Installoo® Pro-Line work stilts, jobs are as easy as pie. Drywallers for example, have reported that they save up to 75% of time. 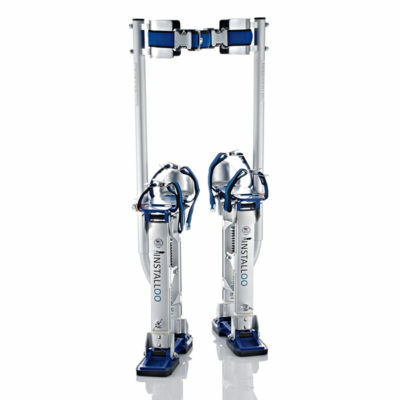 Pro-Line stilts are tested regularly by the TÜV. The anti-slip rubber sole and the tested double spring design allow for a natural gait. Using wingnuts, height adjustment is made possible without any additional tools. Adjustable leg straps provide comfort and a secure fit. These working stilts from American manufacturers Installoo facilitate work procedures in assembly work and are very comfortable. A pair of painters’ stilts can withstand up to 105 kg. Special fasteners allow for diverse change in height without additional tools. As a customer you will find practical accessories and spare parts for Pro- and Consumer-Line stilts. The craft stilts have been made to a high standard. If a part needs to be replaced, this spare part can be inexpensively bought later in the Stelzen-Shop. In painters’ stilts these parts can be installed easily. Due to health and safety regulations, only light work may be carried out while wearing Pro- and Consumer-Line work stilts. The craft stilts should only be used on flat floor surfaces. The use of scaffolding is not permissible for Pro- and Consumer-Line stilts. Wall openings are sufficiently secure. Another assistant without stilts should be present. In these circumstances we know of no accidents having occurred. The Technical Inspection Association (Technische Überwachungsverein, TÜV) awards the coveted seal of quality. Only the Pro-Line has been verified by the TÜV. Installoo® craft stilts, work stilts and painters’ stilts are manufactured with precision. The Pro- and Consumer-Line guarantee excellent quality. Operation is easy to learn, saving worktime. Installoo® stilts are distributed via partners in various regions of Germany. Products of Installoo® GmbH are available throughout Europe via the online shop Stelzen-Shop.de.